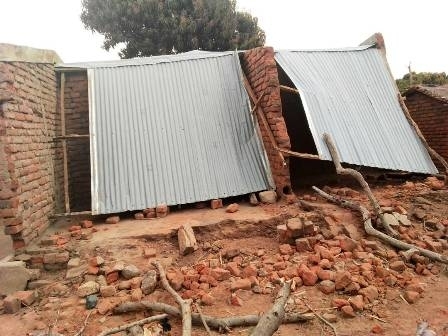 At least 61 houses in Maoni Village in Traditional Authority Nazombe have been damaged by strong winds, forcing members of the affected households to endure the prevailing harsh weather conditions. The incident is said to have occurred over the weekend. A report filed at the District Commissioner on Monday indicates that out of the 61 houses, three dwelling units were completely destroyed while 58 houses were partially damaged although left in inhabitable state. The District Commissioner for Phalombe, Gossam Mafuta said currently no one has been displaced due to the catastrophe. However, the DC hinted the need for humanitarian assistance since the affected people were sleeping in the cold because roofs of their houses were blown off. “Additionally, some of their property, especially kitchen utensils, were destroyed and the people may be looking for assistance in terms of plastic buckets, pots, plates, cups and any kitchen utensils that can replace the ones that have been lost,” said Mafuta. According to Civil Protection Committee Chairperson for the area (Nazombe), Charles Muchiwa, no injuries were reported in the disaster. “One good thing though, is that no one has been hurt in the accident. But the affected people will need help to recover from the shock and return to normal life,” Muchiwa said. Meanwhile, the district has forwarded the report of the accident to the Department of Disaster Management Affairs (DoDMA) for attention.